Chinese landscape painting developed and flourished during the Tang and Song dynasties (618 -1279 AD). * This shadowbox composition reflects some of the compositional techniques employed by artists of the period. 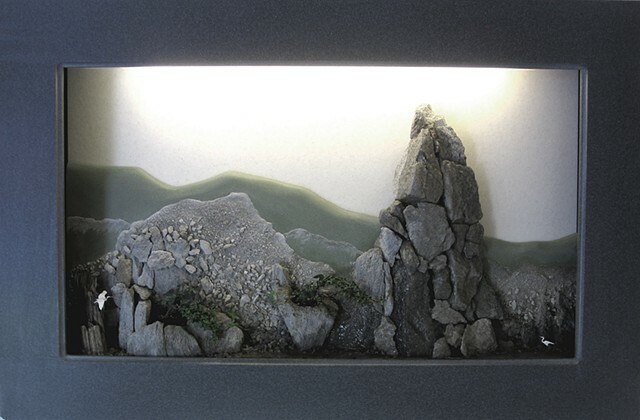 Live plants, rough stone, and miniature bird figures in the foreground overlay smoother shaved layers of feather rock, receding to green slopes in the far distance. A recessed fluorescent grow lamp accentuates the surface textures and facilitates plant growth, allowing this composition to be located on any wall, irrespective of available sunlight. 35" x 23" x 5"